Joe Crawford blogged this at 11:25pm in 2008 in November. The 3rd was a Monday. You are reading this 10 years later. Comment. There are 3 comments Tweet. Send email. It has hashtags→ photos politics . People who vote don’t typically need to be reminded. I too am tired of politics… though I successfully nagged my co-worker into registering and then voting for the first time (he’s 28). I’m so proud of him! 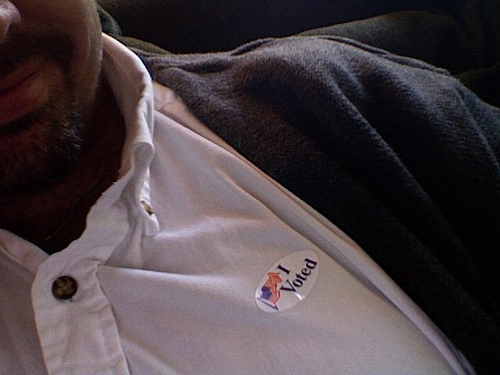 and he voted! and got his wife to register and vote too! and my friend (who is native american) here in New Mexico’s grandfather is voting for the first time in his life (how awesome is that?!). apparently on the reservation its pretty common to NOT vote, because as my friend says they are more tuned into tribal politics– I might opine that perhaps native americans feel disenfranchised in general. However, Obama’s campaign has been at pow wows…. so whatever the outcome, getting more folks involved is a good thing.